Kate and Brittany were married on December 30, 2017 at Solterra Winery and Kitchen. 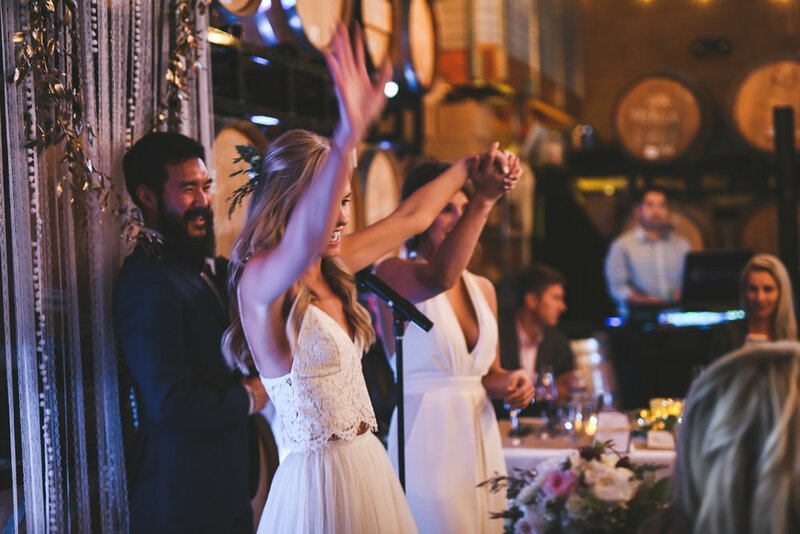 The 2017 event season closed out in fine fashion with Kate and Brittany’s wedding, a small gathering of their closest family and friend on December 30, 2017. It took place at Solterra Winery and Kitchen, located in Leucadia, California. Kate and Brittany are friends of mine, and in fact, Kate and I were discussing how she might be the leader in San Diego for most DJ Kanoya events attended. Between fitness events and other weddings, she’s been at a large handful. But this event was the most important and turned into a wonderful celebration of love. From high energy dances, to Wilson Phillips sing alongs, I had as much fun as their guests. Here’s a look at the setlist. Jason and Sheri's first dance at the Lodge at Torrey Pines. Guests at Sheri and Jason’s Lodge at Torrey Pines wedding take a dance break from their dinner. When it comes to DJing weddings I sometimes meet people for the first time on their wedding day. There are times when I meet couples via a mutual friend, before they are engaged and eventually DJ their wedding. And sometimes I meet someone who isn’t even dating anyone and years later, I end up DJing their wedding. Such is the case with Sheri and how I came to be the DJ of her and Jason’s wedding at the Lodge at Torrey Pines on September 2, 2017. Sheri and I met at Torrey Pines State Preserve in early 2014. I was attending a run club meet up she was leading in early 2014. Fittingly, three years later, we were just a few miles from that spot, celebrating her and Jason’s wedding at the Lodge. And what a dance party it was. While we had a few short dance sets during dinner, it was inside where things cranked up. With just a couple of hours, there was no time to build up, just hit hard with some great dance tracks filled in with plenty of the bride's favorite, Justin Timberblake. Naughty By Nature - Hip Hop Hooray to O.P.P. The golf course at Morgan Run Resort presents a beautiful backdrop at Maria and Nicholas’ wedding. Maria and Nicholas’ wedding, August 4, 2017 at Morgan Run Resort, was a gathering of friends and family in a beautiful location. 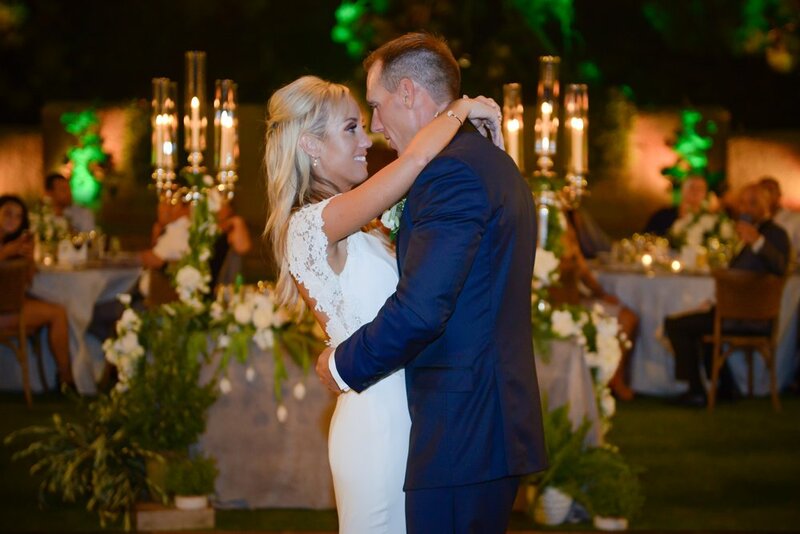 They had both their ceremony and reception at the lush golf course in Rancho Santa Fe. This was one crowd that came to dance, evident by how most guests started filling the dance floor before the dinner. Here’s the setlist, with a pretty short dinner hour and a dance set filled with some hot dance tracks. One of the great things about our kids making friends is the fact that in most cases the parents become friends too. Such is the case for Lily. We’ve known her family since our daughters started kindergarten five years ago. They continued to go to school together for the next few years and despite them not attending the same school anymore, we still keep in touch. Lily’s 50th birthday was celebrated at Elka Yoga and Wellness Center. The location made for a unique event, with supervised aerial yoga to start and then a dance party for the rest of the evening. It was a great night spinning some 80s classics, freestyle and a close out to Lily’s favorite song, “Melt With You,” by Modern English. Afrojack f./Mike Taylor - SummerThing! A photobooth and dancing (DJ Kanoya) were a part of the activities at this 50th birthday party.